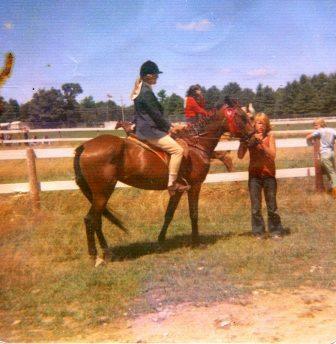 I was sorting through my stuff this morning – the project continues – and I came across a picture of my first horse. I am in show attire and Josie is in hers. Her mane and tail are braided and her coat is glossy. A neighbor kid is holding her. Oddly enough, Josie looks really small. She was 14.2 hands, which is pony-sized. However, she was a Standardbred, not a pony. She was also, quite obviously, a mare. I was the first person to ride her. I was then fearless and so was she. I came off a few times, but overall, I found her to be a willing partner. She was my spirit horse – she got me through a very rocky adolescence. horse, and because there was so much time in between my owning her and Josie, I presumed that all horses are like her. I am glad I presumed this because I would have been in for a rude awakening if it had been the other way around. I have learned that Raudi has certain expectations, and that if I as a rider meet these expectations, then everything is just fine. For example, she will do as I ask if I am centered, that is if I focus on my breathing, center, soft eyes, and alignment. This is very tall order, and I don’t always comply with her wishes. For instance, today Pete and I went for a ride and Raudi rushed down the hills. I soon realized that the reason she was being rushy was because my lower back was tight. I had not done any body work in a few days, and I thought that I could get away with this today. I was wrong. Raudi did not think “oh, Alys is out of alignment so I am going to go hellbent for leather down this steep hill.” Rather, she simply was attempting to maintain her balance. The ride ended on a very good note. On the road home we did serpentines and half-serpentines, using the center area of the road in doing the latter. This was something that I knew that we could do and do well. Raudi’s soft snorts indicated that she thought so too. Raudi has a pony brain. And I got to thinking today, so do I. I am also of the mind that all things must go my way – or else. Given this truism, it is pretty amazing that Raudi and I have figured out how to co-exist. I can’t speak for her. But I can speak for me. She’s taught me to be open minded, to explore options, and to embrace training methodologies that I otherwise would have ignored. My interactions with her have also made me a more flexible human being, both mentally and physically. I am indebted to this remarkable mare, who is my second one-of-a-kind spirit horse.